A remote mountain forest in the country of Georgia is home to the seeds from which grow Nordmann firs, Europe’s most beloved Christmas tree. But the harvest is more akin to a Wild West than a holiday tradition. AMBROLAURI, GEORGIAKakha Kobakhidze struggles up through the branches of the giant Nordmann fir, gingerly testing each hold as he puts his weight onto ever smaller limbs. Reaching up and pushing aside the last, dark green boughs, the 50-year-old finally pops his head through the emerald gloom of the virgin forest into the golden September sun of the Caucasus Mountains. A chain of snowcapped 13,000 to 16,000-foot peaks stretches across the horizon, rising over the forested ridges of Racha, a remote region in the former Soviet republic of Georgia. These far-flung slopes are a long way from your living room, and you might never have heard of it, but the forested valleys of Racha could be where your Christmas tree comes from. 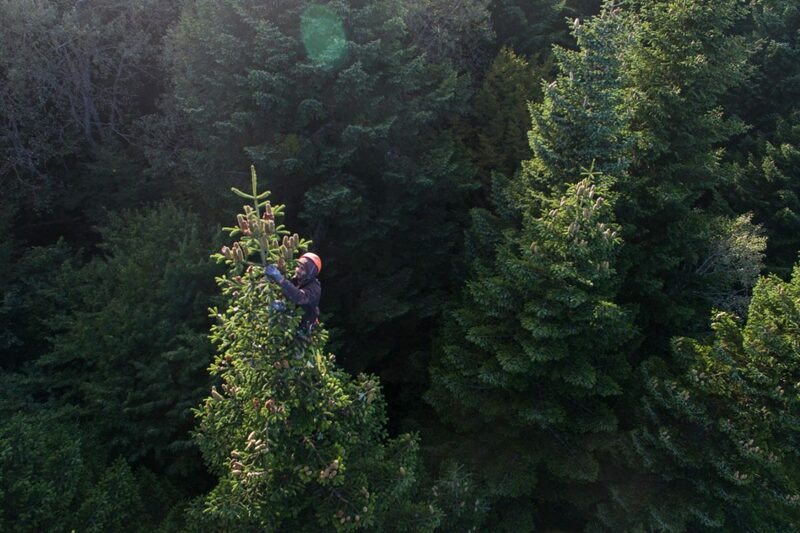 Every year, hundreds of men, women, and children from the impoverished villages of this mountainous region risk their lives to climb more than a hundred feet into the crowns of Abies nordmanniana fir trees and collect the cones, which supply seeds to Christmas tree growers in Europe. Many years, people fall to their deaths. “If you think that [Christmas] is about the birth of Jesus Christ and people are dying to get the Christmas tree into your living rooms, this is really insane,” says Michael Kraus, the German safety coordinator and harvest manager for Fair Trees, a Danish fair trade seed company that pays its pickers a higher wage and supplies safety equipment, insurance, dental coverage, and other benefits. Bols, who is Danish, became interested in the conifers in the early 1980s. As a young forester, she was one of the first Westerners to get access to the evergreens during Soviet times. Swaying up in the treetop, Kakha does not have time to take in the view of the mountains, and he is certainly not thinking about Christmas trees. He wants to get the job done and get down. At this height, the tree is only a few inches around. He lashes himself to the bendy trunk and then reaches out with sticky gloves, twists a lime-colored cone off a bough, and chucks it over his shoulder. The resinous green comet tumbles through space, rockets through a black hole in the canopy, and crashes to the shadowy forest floor 130 feet below with a thud. In a little under an hour Kakha will pick almost 90 pounds of these cones. In a good year, he might throw down around 175 pounds from one tree. Over the coming weeks, Kakha and the other climbers from his village will harvest around 22,000 pounds for Fair Trees, which will yield just over a ton of seeds. The aromatic cones stretch from your fingertips to your wrist and are shaped like a hotdog bun. The cones are collected, bagged, tagged, stored, and then driven more than 2,000 miles in a refrigerated truck from Georgia—situated between Turkey, Russia, and Iran—to tree nurseries across Europe. There they will dry out and naturally open up, releasing the fatty white seeds that will, after between seven to 10 years, grow into the most famous symbol of the holidays. Annually some 75 million Christmas trees are produced on the continent. Of these, around 60 percent, or 45 million trees, are Nordmann firs, says Claus Christensen, the managing director of the Danish Christmas Tree Association. In the U.S., around 25 to 30 million trees are sold every year, with between one and two million being imported Nordmann firs, which are considered exotics. In Germany this year, trees are selling for between $35 and $60 for five to eight-foot-tall Nordmanns. No unified statistics exist for Christmas tree sales across the European Union, but it is a multimillion dollar industry. By contrast, most cone pickers in Georgia make about 21 cents per pound of cones. This margin is shaved even thinner when local villagers subcontract the work to even poorer lowlanders, who come up to the mountains to work the harvest. These laborers make about 16 cents per pound. The team from Fair Trees makes about 90 cents per pound. Down the slope from Kakha and the Fair Trees block, through dense forest and a thick undergrowth of tangled vines and waist-high ferns, the sound of cones hissing and thwacking through the canopy can be heard. I scramble up the other side of the shallow valley with Kraus and find three pickers working for Levinsen & Abies, another Danish company that owns the rights to the adjacent block. Dato, one of the harvesters, rests against a sapling in the undergrowth and then heads up a nearby tree. 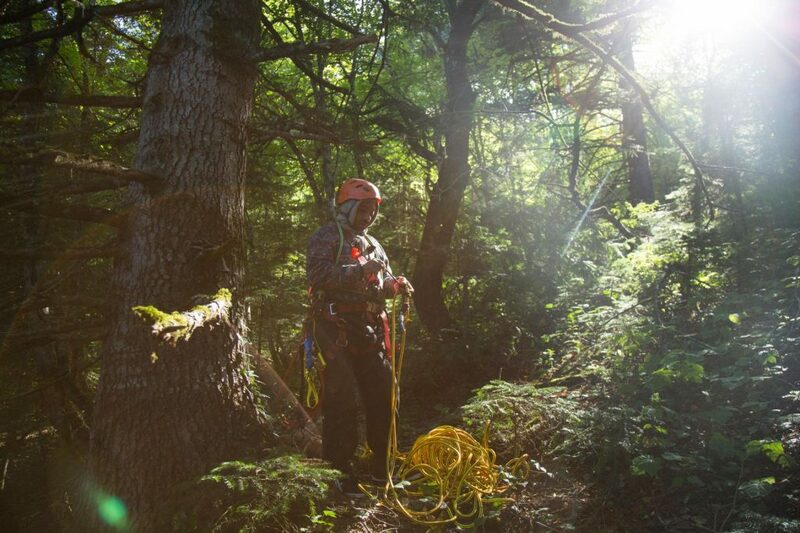 In contrast to the Fair Trees team, who are given rope, harnesses, helmets, and training and are required to use them, these workers are not supplied with any safety equipment. Unencumbered with heavy ropes, the man steps easily from branch to branch. In minutes he is more than a hundred feet in the air, tossing cones down to the ground. Steffen Havelund, a manager with the company, comes through the forest and asks us what we are doing. The professional forester has been working in these woods for almost 35 years, having studied the Nordmann fir in its natural environment in the USSR—no small feat during those closed times. When asked if his climbers need safety equipment, he says that the branches are sturdy enough if you step on them close to the trunk. Havelund allows that one worker, years ago, died while in a tree, but that was because he had a heart attack. Asked again if he thinks it is fair that these men have no safety equipment, he is silent. “This [tree] is a ladder,” he says. “As long as you step right close to the trunk, it can hold your weight. So it’s no problem.” There are no statistics on the number of people who are killed every year climbing during the harvest. It is not clear how the Nordmann fir became such an essential part of the Christmas tradition in western Europe. The tree is named after Alexander von Nordmann, a Finnish biologist and son of a Russian imperial army officer. In 1834 he became the director of the Odessa Botanical Garden in Ukraine on the Black Sea. He spent years exploring the region and has a number of species named after him. The tree itself occurs between 3,000 and 7,000 feet and is found in the mountainous regions of Georgia, Armenia, Azerbaijan, Turkey, and the North Caucasus in Russia, growing along the southern and eastern shores of the Black Sea. Sochi, site of the 2014 Olympics, is a Georgian word that means fir. The trees average between 180 and 200 feet tall and can be more than six feet across. Part of the tree’s continued popularity is its scent. The forests of Ambrolauri are redolent with it. But it is also easy to decorate, since the needles are soft and not pointy. It also retains them. “After Christmas, you can carry a Nordmann fir tree out of the living room,” says Havelund. “A Norway spruce, you have to vacuum it out. That’s the difference.” The foresters all laugh at the joke. But there are economic reasons as well for European tree growers to make the trek out to a remote region like Racha. The temperate climate here in the mountains is similar to that of northern European countries, meaning that the trees sprout after annual frosts kill off other imported species. And, though the foresters debate the reasons, growers believe the seeds harvested from these natural forests grow into better trees than those grown from seeds taken from trees grown in Europe. So, for now, there is still a massive demand for seeds taken from the wild. That demand, as well as local poverty, encourages poaching by “cone pirates,” as the foresters call them. Back at the Fair Trees site, the pickers, all from the village of Slugi—after which this forest is named—are resting from the strenuous work. Then they stand up and start collecting the cones Kakha has thrown to the forest floor. The sound of cones plunking into rusty buckets fills the woods. Kraus decides this is a good time to check on Fair Trees’ other blocks for pirates. He jumps into his SUV and crashes out through the undergrowth. There are no real roads here. He smokes cigarette after cigarette as we drive up an improbably steep mountain path. We suddenly stop and he jumps out. He motions for me and his assistant, Giorgi Macaberidze, a well-known Georgian rock climber, to be quiet. He stalks off through the giant trees, his dreadlocks bouncing against his back, and stops to listen. We stand, intent, but hear nothing. We stop, again and again, but hear only woodpeckers. The next day, the crew from Fair Trees has exhausted the block, though they leave about 20 percent behind, to replenish natural stocks. They pack up the ratty mattresses they sleep on in the forest during the harvest and their blankets, rolling them onto nearly a ton of harvested cones. Then they too chug off through the forest. After weighing and depositing the cones in the ramshackle barn of one of the pickers, they head back out to the block where Kraus had unsuccessfully searched for poachers the day before. Grinding up the steep, muddy track into the forest in a giant Soviet truck, the pickers reach their block and get out. From the trail, they can see the telltale signs of poachers. None of the trees along the path have cones. The tops of some of the trees have been broken off. Kakha gets out and heads into the forest to see how bad the damage is. We find a red rubber glove covered in sticky pine resin hastily abandoned under a tree. Cones lie among the tangle of vines on the ground. “There aren’t any cones left,” he says, with a disappointed shrug. The pirates “were here yesterday, but didn’t have time to collect them.” He thinks maybe the poachers heard Kraus’ truck and fled. See more of John Wendle’s work at johnwendle.com, instagram.com/johnwendle and vimeo.com/johnwendle.